Ubisoft has revealed an Assassin’s Creed: Brotherhood multiplayer launch trailer to coincide with the games release in the USA today. The new Assassin’s Creed: Brotherhood multiplayer launch trailer tells us that “People are rarely who they seem” and “This is a truth often released in one’s final breath” The trailer demonstrates the characters and locations that are available in the Assassin’s Creed: Brotherhood multiplayer mode. Oh, and of course it shows a wide variety of ways to do away with an enemy in the cat and mouse world that is Assassin’s Creed: Brotherhood multiplayer. You can check out more details about the Assassin’s Creed: Brotherhood online multiplayer, including game modes and character classes, in this previous post on the Train2Game blog. The brand new multiplayer mode is just one aspect of Assassin’s Creed: Brotherhood, with the game of course featuring a vast single player story starring Ezio from Assassin’s Creed II. You can check out the Assassin’s Creed: Brotherhood single player launch trailer in this post from a few days ago. 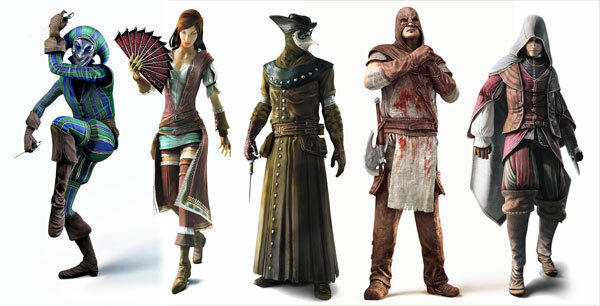 Assassin’s Creed: Brotherhood is released here in the UK on Friday for the PlayStation 3 and Xbox 360. So Train2Game, what are your thoughts on the Assassin’s Creed: Brotherhood multiplayer mode? Is it something you’re looking forward to? Or are you only interested in the single player story? And do you think that Assassin’s Creed: Brotherhood could do the seemingly impossible, and knock Call of Duty: Black Ops from the top of the charts? You can leave your thoughts about Assassin’s Creed: Brotherhood here on the Train2Game blog, or on the Train2Game forum. This entry was posted in games, Train2Game and tagged Assassin's Creed Brotherhood, Assassin's Creed multiplayer, Call of Duty: Black Ops, Train2Game, Ubisoft, Video Games by Train2Game Blogger Team. Bookmark the permalink.